Continuing the story from the prequel, Strike Witches 2 is here for more pantless alien-fighting girl action! It's bigger and better and more ... cute? 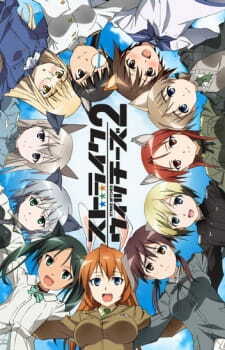 Perhaps, if you haven't had enough of Strike Witches then you must watch Strike Witches 2! Just when you though everything was over and its happy days for everyone, a new form of Neuroi decides to pop-up and invade the Earth once again. So it is up to these girls to reunite and fight off those pesky aliens in an all-out battle between good and evil. That is how the story is basically all about. Pretty linear once again and is expected from this type of anime. Similar to the prequel, the girls basically do training everyday, fight off some aliens that seem to pop-up randomly at the most inconvenient times, then repeat the process a few times. What can I say? This anime is pretty much made up of mostly slice of life, couple of comedy fillers and a few actual serious alien battles. The art was pretty much the same as the prequel with nice detailed art of characters and background environments. The girls still don't wear any pants at all, which is expected of this anime. I noticed that the aliens looked bigger and more complex and some weapons were given some nice upgrades. The use of more military equipment and transport is seen here. The theme songs were much better this time around with some nice catchy pop tunes and some gradual tempo in them. Voice acting was excellent; same as before. We see the return of all the characters from the team in the prequel. This time with more laughter, character development and cuteness. It's all here for you moe fans. Overall, it was a nice sequel to end the series. Everything much pretty much the same formula as before; train, fight, play. The story was rather weak and predictable as before. You would probably watch this anime for its cuteness and funniness. Other than that, expect standard military action and alien combat. Rather linear and repeated formula. Nice detailed characters and background environments. The theme songs were better this time. Voice acting was standard. A couple of new characters but not much change from the first series. Nothing new here. Just improved battle scenes and some weapon upgrades. If you are into pantless girls fighting aliens whilst flying in the sky then give this a go.